The Carbon Sense Coalition today called on Australians and Americans to join the world in celebrating Climate Fools Day on October 27th. The Chairman of “Carbon Sense”, Mr Viv Forbes, said that Climate Fools Day was named by protestors outside the British House of Commons on 27th October 2008 when the house was debating the Climate Bill. “As the first October snow in 70 years blanketed the House (and a big swathe of Europe), MP’s droned on about the need to fight global warming. “For six hours MP’s reassured one another about the desperate need to be the first government in the world to saddle its unfortunate people with a burden estimated at £15 billion a year. As snow continued to blanket Westminster, only two MP’s questioned the huge cost and dubious benefits from the energy taxes and green energy rorts they were imposing. “The Bill will go down in history, and future generations will see it, as the most absurd Bill that this House and Parliament has ever had to examine". “The weather gods were the first to draw attention to the stupidity of the Climate Fools in Westminster. Weeks of icy weather froze the whole of Britain, wind turbines froze, solar panels were covered in snow, but coal, gas and nuclear power stations running at full power for 24/7 averted calamity. Power lines broke, stopping electric trains - on one line in Scotland the only train running was an old steam train burning coal. "And ignoring the consensus predictions of global warming, a Snowy Owl, native of the Arctic Circle, arrived in Cornwall in December 2009, heralding another cold winter in which the sea froze on the Dorset coast. “Luckily, the appalling foolishness which started at Westminster has not spread far, but sceptics world-wide will be celebrating Climate Fools Day to ensure the suicidal example of once-great Britain is not followed anywhere else. 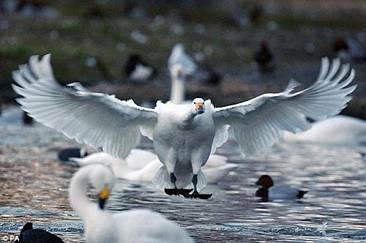 Forbes said that word on Climate Fools Day had already reached Siberia because Siberian swans, which usually reach Britain in November, flew into Gloucestershire on 18th October, 2010. “Winter usually follows the swans, and Westminster is again likely to be blanketed in snow when Climate Fools Day protestors again gather outside the British Parliament. US publisher, Stairway Press, have chosen the Climate Fools Day gathering in Westminster to make the inaugural presentation of the "Ernst-Georg Beck Award for Scientific Integrity and Competence" (BASIC). Piers Corbyn gets the US$10,000 award for “his untiring efforts both as a climate skeptic and for his outstanding success in long-range weather forecasting”.